March 2014 Because most people have some stress in their lives, everyone needs some basic stress-management tools. It may not be possible to avoid stress, but it is possible to give yourself the best opportunity to cope with it. April 23, 2014 Depression is an illness, and is not the same thing as being sad or unhappy, although those feelings may be symptoms of depression. Dr. Simone Vigod, a psychiatrist at Women's College Hospital, explains the difference. Oct. 10, 2013 Postpartum depression is a depressive episode that effects new mothers. It is a common condition, but there are factors that put some women at greater risk. 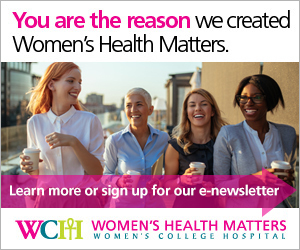 Aug. 2013 Women’s Health Matters spoke to Dr. Cindy-Lee Dennis, senior scientist at the Women’s College Research Institute and Shirley Brown Chair in Women’s Mental Health Research at Women’s College Hospital, about the difference between baby blues and postpartum depression. May 31, 2013 Pregnant women facing depression may also face the dilemma of whether or not to treat the depression with antidepressants. Untreated depression during or after pregnancy has been linked to an increase in poor outcomes in both mother and child. However, depression in pregnancy often goes untreated because of concerns about potential negative effects of antidepressant medications on the fetus. Oct. 19, 2012 New mothers are most often assessed for postpartum depression in the first 12 weeks after giving birth. However, new research shows that for a significant number of women, postpartum depression can last throughout the first year and beyond. Sept. 24, 2012 Results of a new study show that women with schizophrenia are now having more babies than they have in the past. Sept. 13, 2012 When we think of students heading off to university in the fall, mental health might not be the first thing that comes to mind. But it’s a topic that may merit more thought and resources. May 9, 2012 For mental health week (May 7-13), Women’s Health Matters takes a look at trauma-informed care. Dec. 1, 2011 Read our feature highlighting holiday stress, with tips to make this season stress-free. Sept. 14, 2010 Trauma therapy is a specialized type of psychotherapy that focuses on helping people work through traumatic events. Women's College Hospital psychotherapist and art therapist Eva-Marie Stern talks about how trauma devastates lives, and how trauma therapy can help.